Management of a combined injury to the posterior cruciate ligament (PCL) and the medial knee complex, consisting of both the medial collateral ligament (MCL) and posteromedial corner (PMC), remains a highly debated topic. Specifically, which injuries are addressed surgically, optimal surgical timing, and what types of repair or reconstructions are most favorable remains unclear. Low-grade PCL injuries combined with low-grade MCL tears may undergo a trial of conservative treatment with hinged bracing, progressive weight bearing and range of motion exercises, and physical therapy. However, the majority of combined PCL/medial knee complex ligamentous injuries require operative intervention to prevent persistent acute and potentially chronic functional instability and degenerative changes. Acute early single-stage surgical intervention, optimally within 2 weeks of injury, helps avoid the formation of scar tissue, maintains tissue planes, and facilitates primary repair in certain circumstances. Reconstruction of the PCL using the tibial inlay technique has proven to be a useful alternative to the classic transtibial technique. 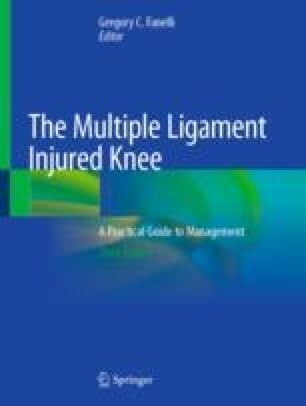 The modified Bosworth technique for acute mid-substance or chronic MCL/PMC injuries helps to restore medial knee stability. Following surgical repair or reconstruction, various protocols exist regarding postoperative care and rehabilitation for combined PCL and MCL/PMC injuries. Often, this needs to be individualized based upon the injury pattern, medical comorbidities, and patient compliance issues.